Give it a try! You can register a user account on the demo site to post topics and replies. Detailed information about the plugin is available in the Documentation. I want a refund where do I go to get one, I have my purchase code. hi, i want to know, can users also login with their facebook accounts? This feature is not available. You could use third-party plugins. I’ve just downloaded this plugin and am having a few issues with it. 2) I’ve added the forum shortcode to this page: http://www.roninbusinessgroup.com/forums/ and that’s showing the list of forums correctly, however I have 3 topics published but when you click to open the forum (which should have topics inside), no topics show up. I tried switching to the 2017 theme and the issue persisted. I don’t understand why they show up here: http://www.roninbusinessgroup.com/topic/ but not within the actual forum. answered by @itthinx on codecanyon. Hello, we are experiencing some issues with Group Forums. Next I made a Comment to the topic, same result..
at the monent there are no restrictions and I am logged in as Admin. what might be the problen? I think this is related to permalink and should be solved easily by simply visiting Settings > Permalinks – after that the pages should be accessible. It sometimes happens, WordPress needs to update something internally and would produce 404s until you visit that admin page. Please excuse the late reply and many thanks for your kind wishes, I hope you had a great start into the new year! Thank you for your email response. I am not seeing my question on this page for continuing the thread. I responded — to support at itthinx dot com — to your email and included credentials to access my website. 1) I see you offer to take a look at theme modifications to fix the layout of theme pages. If so, I’d love help looking at our site and curious how you go about this. 2) We are wanting to have members of a Group be notified of new Topics when they are published, without the need to have them participate. I see you could use an RSS Feed to do this, but I am wondering if you can send RSS based notifications through the Groups Newsletters extension. Otherwise has a solution like MailChimp RSS-based Newsletters worked in the past? #1 Please have a look at http://docs.itthinx.com/document/groups-forums/themes/ for details on how we can help you to adjust the templates to your theme. #2 With Groups Newsletters at current you would not be able to have automated notifications send out, it would have to be done manually which wouldn’t make much sense for what you want to achieve. RSS could be an option but the problem is that protected topics wouldn’t appear. You could use a plugin that lets you subscribe to a post type – Jetpack’s subscriptions could be an option https://jetpack.com/support/subscriptions/ or there is Subscribe2 https://wordpress.org/plugins/subscribe2/ – I haven’t tested any of those yet but if you’d like to have a look maybe that could be an immediate solution. To be honest, I haven’t seen one single solution to post/comment subscriptions and notifications that I find fully satisfying. We do have something in the works for which I can’t give you an ETA yet unfortunately. Hi – I have a set of nested forums: “ALL Team forums”, which contains Team-1 forums, which contains the Team-1-Week-1 forum. Similarly Team-2 and Team-3 forums, which each contain multiple weeks. When I Click on the link for a PARENT forum (eg, Team-1 forums) I the result I get displays ALL THE TOPICS for the descendant children forums smooshed together. This is not ideal for me. Is it possible for that link either to do nothing (ie, not be a link), or preferably, display a list of its children FORUMS. Can this be changed somehow? Also: This may be a typo: “Topics are edited on the Back End just like normal posts or pages.” on page http://docs.itthinx.com/document/groups-forums/forums/ . Should it be “Forums are edited…”? Can you please provide a link to the page and grant temporary admin access to support at itthinx dot com so I can have a look? Please make sure to include a link to this conversation when you send over the credentials. >From this page http://cpsl5.net/p5/forums/ if you click on the “Team 1 Forums” link, you’ll see a table with 5 topics combining Weeks 1 and 2 together. As stated above, I think it would be more helpful if clicking on a Parent forum displayed its next-generation Child FORUMS (or else did nothing) — not display all the Topics of ALL its descendants mixed together. I just purchased the Groups Forums plugin on CodeCanyon. I managed to install the plugin (along with the Groups plugin) and modify the templates to match the design and style of my site (I still need to make some adjustments to display the info the way I want, but that’s not the point). I’m running WordPress 4.5.2. and I’ve built a custom theme based on the bare-bones Starkers 4.0 theme. If I deactivate the Groups Forums plugin all the comments show up in the list on the Comments page in the admin area as expected (I don’t even need to remove it, only deactivating to see the list of comments again). First I thought it might be a theme issue but I guess the Comments list in the admin area wouldn’t be effected. Can you please help me figure out what may cause this issue and how I could solve it? Sorry for the delay. If you change to the original Starkers 4.0 theme, does the comments appear? If you want, you can send me a copy of you modified theme, and I’ll test it on my local installations. Thanks for your reply. Since then I completely removed the WordPress site (deleted all WordPress files and folders and completely removed the database), then reinstalled through cPanel’s Softaculous installer. I left the default Twenty Sixteen theme active and only installed the Groups and Groups Forums plugins. Results are unfortunately the same – the comments don’t show up on the front-end and on the back-end. I created an admin account for you and sent you an email with the login details so you can have a look. I’ll have a look at this. I currently have Groups and Group Forums and Groups Restrictions added to my site. When a user is logged in and viewing a restricted forum and they want to create a new topic, is there a way to “grab” the restrictions for that forum and automatically set those restrictions to that topic? If you want to have access restrictions in place for the forums, then I would recommend to use Groups Restrict Categories which allows to set those (forums are similar to post categories and the restrictions on those can be set using that extension). I’m already using Groups Restrictions. I’m wondering if there is a function that can return an array of the groups that a given forum_id / topic_id are restricted to? Then I’m wondering if there is a function that can set the groups that a forum_id / topic_id is restricted to? Forum A is restricted to Group A and User A is in Group A. If User A creates a new topic using the [groups_forums_topic] shortcode while viewing Forum A, can the system automatically set the new topic’s restrictions to Group A? Working with Groups Forums and have a suggestion or possibly a question of how to accomplish a task easier. The code works like a charm to bring up the “Submit a topic” form, but regardless of which forum you are looking at, there is always a dropdown box and I wanted the functionality to be such that it always posts the new topic in the forum of the page the user is currently on. I inserted these lines to class-groups-forum-shortcodes.php after line 319. If you can let me know if there is an easier way to do that, otherwise, I might suggest this be an edit to a future version. Either way, I look forward to hearing from you. you can try to set the forum_id before to call the shortcode. This same thing has been happening for some months. And I get the same error when I create New topics. Thanks! It seems that the plugin is using the old prefix ‘wp_’. Please check you have change ‘$table_prefix’ in wp-config.php file. Yes, $table_prefix is correctly set. And if it weren’t, I doubt the site would function at all. Even when editing topics — which generates the error — the editing DOES work. Somehow, in this one query or “call” (?) to the DB Table, it seems to be calling without the correct prefix. Thanks. * Returns the user ID of the next topic assignee. please try to reinstall the plugin. If the problem persists, you can send me dashboard admin access to antonio at itthinx dot com, and I’ll have a look at your settings. i am interested in your plugin, but one for one feature : I would need my groups not to be able to read other groups forums and posts, but only the forum/post of their group. is this not possible at all ? Yes, you can restrict the forum/topics to be visible only to certain groups. Hi – After some research I changed MAMP to use PHP 5.6.10 instead of PHP 7, and I’m back in business. Sorry to bother you with this. Yes, I’d like the topics automatically published. But what I’m asking for here is that Users have *no choice about which forum the topic is published in. The only fields they would fill in are: Title, Descriptioin (preferably wysiwyg), and Tags. The Forum field would either be absent, or invisible, or unchangable (and pre-populated with the forum that is being displayed). (Agiain, I have placed this form (using the shortcode) at the bottom of the page displaying a single forum’s topics, so that Forum-ID should be available, I would think, to pass back to the DB). I’d be happy to pay for such a revision. You can restrict the forum in which the topic is posted by passing the forum_id in the URL. If that parameter is in the $_POST or $_GET before the shortcode is handled, it will restrict it and instead of the dropdown. Does that help you? Hi Kento — I’m afraid your suggestions are beyond my skill level. I can try hire someone locally to implement them or, because it might be much quicker for you to implement them given your intimate knowledge of the plugins, I’d be happy to pay you for your time. Thanks for trying! I assume you’ve found someone by now, please excuse the delay in responding. If there’s anything else I can help you with, please let me know. 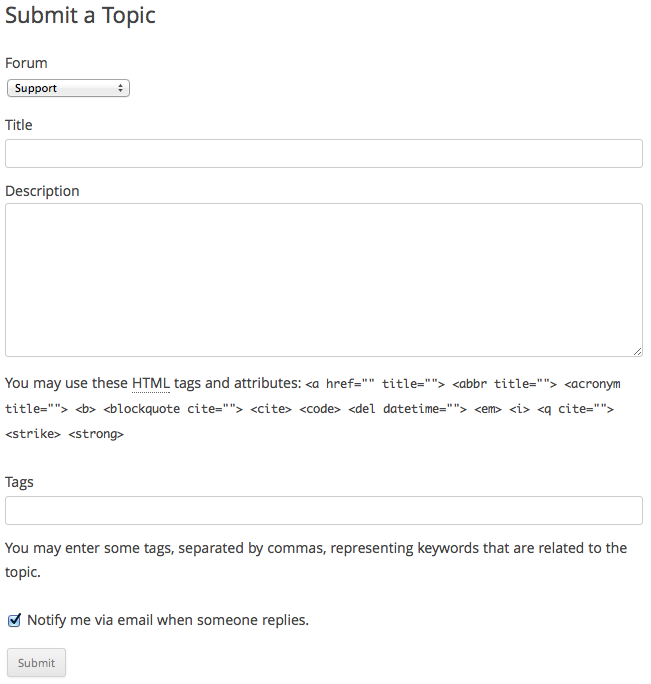 Hi – Using your shortcode, I have placed the front-end FORM for creating NEW TOPICS at the bottom of the page that displays the topics in a forum. I would like new topics created *in this manner to AUTOMATICALLY and always BE CONTAINED in the forum being displayed. Can this be done? I’d be happy to pay for a plugin revision if needed. Do you mean you want them automatically published? You can use the option here Topics > Settings > Topic Status for that. If you want to include the form on any forum, then you can also modify the template by rendering the shortcode <?php do_shortcode('[groups_forums_topic]'); ?> – see http://docs.itthinx.com/document/groups-forums/themes/ for details on the templates. this Monday I`ve purchased “Groups Forums” to set up on 1 Website. I`m the author of this site`s theme and since day 1 it uses your Groups-plugin which is working perfectly. I could install the Groups Forums plugin without any problem and it seemed to work at first glance. Sure, the support email is support at itthinx dot com but if that fails, please post a link to your template files. please try to visit Settings->Permalinks and Save Changes on page. This will regenerate the permalinks. If this method doesn’t work, be sure you have not other plugin relating with rerdirections. It could be, you can try to select another theme and test it. you should have this string in your .pot file, like as: You can <input class=\"button\" type=\"submit\" name=\"subscribe\" value=\"%s\" title=\"%s\" /> to this topic without leaving a comment. 1. When i logged in “Notify me of followup comments via e-mail. ” and “You can also subscribe without commenting.” in different places. First one in comment form and second after form its looks not good in my theme. Could you please let me know which theme you are using or a URL to see how this looks like? Yes offcourse. On which e-mail can i send url? You can simply post it here, unless you need to have it private in which case you can send it to support at itthinx dot com. Which theme are you using please? Its sentient by woothemes. I will send to mail. Re #1 the #respond element has CSS rules with a box shadow and a border applied which creates the separation. You should remove these or adjust them to make it visually more coherent. #2 Have you checked which option is active under Topics > Settings > Comment Registration? It should be consistent with what you see there when logged in or not. Good day! Its not possible to show comments and topics by current user? I using userpro profile page and it generate page for each user. Comments its not a post type? Thanks! you can use the ‘[groups_forums_user_topics]‘ shortcode to display the topics. Comments are based on the wordpress comments. Hi Antonio. Shrortcode ‘[groups_forums_user_topics]‘ show topics of current logged in user. But i asking about topics that created by user that profile page we are landing. I mean like bbpress we click on link to profile page and see all topics that were created by that user. if you use the [groups_forums_user_topics] shortcode without the ‘all’ param, it should display the topics with the current user as author. HI Antonio – I’m very glad that version 1.5.5 of GF does hide — in the Topics and Recent Comments widgets — lines (eg, Topic titles) when the Topic is restricted from the current User. That’s a big help. Thank you! 2 Problems: 1) I may want to use the twentysixteen theme, eg, because of its responsive design. For some reason, with “2016,” on the Single Forum display page, no topics are appearing — only the header, the Forum title, and the words “Post a new Topic” (and widgets in the sidebar). (When I return to the 2012 theme, the topics DO appear as they should … [tho I’ll be hoping to reformat the info into a Table]. Can you help with these 2 things? Thanks! wp 4.4 According to WP, the Groups family of plugins are all up to date. Worked great! Thanks so much, Antonio! with Groups Restrict Categories you can limit the access to forums. Hello. I installed the plugin and it looks like it is working, but it is not showing the posts list in the forum page. please give us your wordpress, Groups and Groups Forums versions. If you can, please give us an url. sorry for the delay. These versions should work fine. If you send us dashboard admin access to support at itthinx dot com indicating this conversation, we’ll have a look at your settings. How do I do that? do I need to register? I cant find a registration page, only login page. Is it possible to move this conversation to email? Please send us an email to support at itthinx dot com. sorry I was waiting for the admin credential by email. Answered by email. Ok, Im not getting any help here….. The problem was a conflict with the TwentyTen theme. By the way, I did a translation of the plugin in French with Poeedit. I can send it to you if that’s of interest..
We will be grateful if you send us the translation to itthinx at itthinx dot com. I finally had the system working with small tweaks in the template (actually supressing the use of the custom template for single-topic….I’ll take time to optimize it a bit later on. Thank you so much Greg ! I used s2member to create 298 recurring subscriptions. Now I’ve transferred over to woocommerce with groups along with affiliates pro and upgraded to reference transactions. What steps do I take to allow affiliates pro to track recurring payments created with paypal standard so that recurring compensation is recorded for members of the specific groups? You’re posting on the wrong page, this page is for Groups Forums which is unrelated to your question. Please use the premium support forum for Affiliates Pro here for such questions. Also you can review this documentation page related to your question. Probably a long shot but any chance of this forum plugin being hooked up to Facebook Groups sometime? Was working with BBpress and Add Link to Facebook,( which when working allows forum posts to post to FB and vice versa) but I’m considering switching over to this and not sure how that plugin will work with it in the future, but if you feel like making another cool plugin, I’d pay for both. Thanks for the suggestion, the idea actually sounds very interesting to me. Let’s talk? I’ll get in touch with you with a quick email. Good day! It would be awesome if subscribe would be possible not only to topics, but to forums too. That would certainly be very useful. Many thanks for the suggestion, goes right on top of our feature todo list! Hello, I recently purchased Groups Forums thinking it would bridge the gap between Groups and bbPress, and was extremely disappointed when I found out that GF was indeed it’s own forums plugin. I know I should have researched it a little better, but regardless, this plugin is not doing what I anticipated at all! Even wit Groups Forums Restricted, topics are still readable by non-members of a group, even though comments are not. I was wondering if there is a possible way for a refund due to having purchased it less than an hour ago and I have no intentions of using this plugin ever again. Please contact Envato support for this, as the sales for this plugin are handled through the CodeCanyon marketplace. In this case, there should be no problem with getting a refund, it’s not what you expected and you clearly purchased it by mistake. Hi, we are running Groups and Groups Forums. We have selected Notify site admin and members of “Topic Moderators” group when a topic is published, but we are not getting notifications. When a visitor comments on a forum post they do receive notifications. Any ideas? I don’t understand why you keep “Liinks” admin menu in the plugin. What is the point of this menu? Could you erase this menu in a next update? Where you have the ‘Links’ submenu ? Is there anyway to restrict access to a forum to a group which isn’t registered? For example I’d like “Example Group” To be able to go in “Example Forum” But not in a different “Example2 Forum” Is there anyway I can do that? I don’t really understand how to restrict individual forums in Groups Forums Restrict so.. Can I have some help? You can restrict forums by group, see details on Forums in the documentation please. Is it not possible to have the forums be completely private as well? I tried to search for this in your documentation and all I can see is that the access to the forums can be restricted to particular users, but the forums themselves will be public, is that correct? Is there a way to make them private with the Groups shortcodes? There’s one little helper plugin Groups Forums Restricted. I would like all Forums, Topics, and Comments (and their titles) created for/by Group 1 to be INVISIBLE to everyone who is not in Group 1. And the same with Group 2, etc. Is this possible with GF-Restricted or in some other manner that isn’t too complicated? Also, can User-1 be made a moderator only for Group-1 and Group-2, and User-2 be made a moderator only for Groups-3, 4, and 5? Ie, can capabilities be made group-specific? Other than this possible concern, it looks great! To restrict read access to the forums you can use Groups Restrict Categories. Group-specific moderators are currently not supported, it’s possible that this is added in a future release but I can’t promise on an ETA for such a feature yet. 2) is the ‘groups forum’ separate from ‘comments’ in wp? if a reader comments on a post will it become part of ‘group forum’? 2) is it possible for a user to upload an image in a topic/reply? #1 The comments on topics are comments like on other posts but the comments left on a topic belong to the topic, not to another post. #2 No, they would need to place a link for that. sir, can a user who is already a registered user on my wp site, log in to ‘groups forum’ using the same credentials? or do they need to register separately for ‘group forum’. They use the same login as for the WordPress site, it’s not a separate forum system but fully integrated with WordPress. Hi, I am unable to find how to allow members to subscribe to a specific forum or topic? On Topics->Settings you can select send notifications to the comment authors and the post author. Sounds interesting the option to subscribe without participating. I communicate this to developers. Hi is there any way to get an rss feed url for forum topics or the forums as a whole? How could I make sure that all users in a particular group get a digest of the forums content relating to them say weekly? This is a relatively small membership site and I don’t think people will check the forums regularly but I’d like them to be able to see the information shared there regularly. You could provide an RSS feed for topics in general or for a specific forum, e.g. using the RSS widget indicating http://example.com/gf/?post_type=topic&feed=rss2 as the RSS feed URL. I set up a forum and a sub-forum. Then I wrote a short topic. I went to the Permalinks page as suggested, as the topic gave a 404 error. However, when I click the forum link now with the topic, it does not show up on the page. So, at least I’m getting into the forum, just not seeing the topic displayed there. At the moment, I don’t have any topic moderators group and as far as I know the topic is published properly. Any other setting you can suggest so that the topic shows up? This is on a staging site. If the topic is published but doesn’t show on the forum page then it might be because the template used to display the forum page needs to be adjusted. Can you please have a look at http://www.itthinx.com/documentation/groups-forums/themes/ and let me know if you need help with that? It looks like there’s a much bigger issue with the theme as a whole. I’ve contacted the theme owner/developer for permission to work on the theme, but it’s not going to happen. I really would have liked to have used this and had high hopes of it, but, it’s not your fault that it’s simply vastly incompatible with what I’m using. Is it OK if I ask for a refund in this case? I’m going with bbpress instead, which is almost working right straight off. Thanks for taking the time to answer my previous questions. Sorry to hear that, if it would be of any use and you would like us to have a look at the theme it would be a pleasure. But if it’s easier for you to use bbpress instead it would be fully understandable and you should be granted a refund on the plugin (please ask Envato as they handle the sales currently, if you point them to our conversation here they should be able to do that without a problem). Is it possible to have forums within forums, that is, have a forum for, say, travel and sub forums for Africa, America and so on, or can they only be separate, standalone forums? Yes, you can have sub-forums. I refreshed updated my permalinks and it seems to be working now. Thanks. New question… is there a way to customize the forum and topic pages. I think they are using single.php. Thanks. Yes, please review the documentation for the plugin, there’s a section on themeing and examples linked to its GitHub repository. Sorry, I don’t know what you mean. We’ve had no issues with permalinks before using the plugin. Can you be more specific? Thanks. Just purchased this plugin, installed, added a forum and topic to the forum. When I try to view the forum or the topic I get a 404 redirect. I have tried without restrictions and with restrictions — both, give redirects. Suggestions? Thanks. Hi Chad, could you please try to visit Settings > Permalinks on your site’s Dashboard? It sounds like the permalink structure needs to be updated. So this is not based on bbpress? And if isn’t why write a complete forum system (gargantuan task) instead of just piggybacking on bbpress? Good question, have a look at the FAQ documentation section under How is it built? and another aspect is outlined on this post. There are requirements that are different from those that underly bbPress. Is there a way to add additional fields to a registration form so when you have a forum, members can have more detailed profiles? For example adding social media links, address, business name, etc. The plugin doesn’t provide customization options for the registration form but there are several plugins our there that do allow to define additional fields. One of them is Profile Builder if you’d like to give it a try. In any case I’ll take the suggestion into account. Thanks, I’ll check out that plugin!